BAGHDAD, IRAQ (ASSOCIATED PRESS) — Iraqi officials said Sunday that the head of the Islamic State group, Abu Bakr al-Baghdadi, was wounded in an airstrike in western Anbar province. Pentagon officials said they had no immediate information on such an attack or on the militant leader being injured. Iraq's Defense and Interior ministries both issued statements saying al-Baghdadi had been wounded, without elaborating, and the news was broadcast on state-run television Sunday night. The reports came at a time when President Barack Obama said the U.S.-led coalition was in a position to start going on the offensive against the Islamic State militants. Al-Baghdadi, believed to be in his early 40s, has a $10 million U.S. bounty on his head. Since taking the reins of the group in 2010, he has transformed it from a local branch of al-Qaida into an independent transnational military force. He has positioned himself as perhaps the pre-eminent figure in the global jihadi community. His forces have seized large parts of Syria and Iraq, killed thousands of people, beheaded Westerners and drawn the U.S. troops and warplanes back into the region, where Washington is leading a campaign of airstrikes by a multinational coalition. An Interior Ministry intelligence official told The Associated Press that al-Baghdadi was wounded by an Iraqi airstrike that came during a meeting Saturday with militants in the town of Qaim. The official, cited informants within the militant group. A senior Iraqi military official also said he learned in operational meetings that al-Baghdadi had been wounded. The operation was carried out by Iraqi security forces, both officials said, although they did not know how seriously al-Baghdadi was hurt. The officials spoke on condition of anonymity because they were not authorized to discuss confidential material. A statement posted Sunday on the official Facebook page of Defense Minister Khalid Obeidi also said al-Baghdadi was wounded, but added that he was targeted in the northern city of Mosul, currently the group's biggest stronghold in Iraq. A senior U.S. defense official said Saturday that the coalition conducted a series of airstrikes targeting a gathering of Islamic State leaders near Mosul, but he could not confirm whether al-Baghdadi was part of the gathering. Reports circulated Saturday that al-Baghdadi may have been wounded in an airstrike, but there was no confirmation at that time from either U.S. or Iraqi officials. The U.S. Central Command said Friday it conducted two airstrikes near Qaim that destroyed a militant armored vehicle and two checkpoints of the militant group, which is also known by the acronyms ISIL and ISIS. On Nov. 1, the U.S. military conducted four strikes in the town. When asked about the Iraqi reports, Air Force Col. Patrick Ryder, spokesman for U.S. Central Command in Tampa, Florida, said Sunday: "We have no information to corroborate reports that ISIL leader al-Baghdadi has been injured." Rami Abdurrahman, director of the Britain-based Syrian Observatory for Human Rights, said some Islamic State militants wounded in the airstrike near Qaim were taken across the frontier to the Syrian border town of Boukamal. "They brought ISIS injured to Aisha Hospital in Boukamal. We don't know if somebody died there or not. We know for sure that they brought some of the ISIS people injured in Roummaneh to the hospital," Abdurrahman said. There was no indication that al-Baghdadi was among those brought to Boukamal. 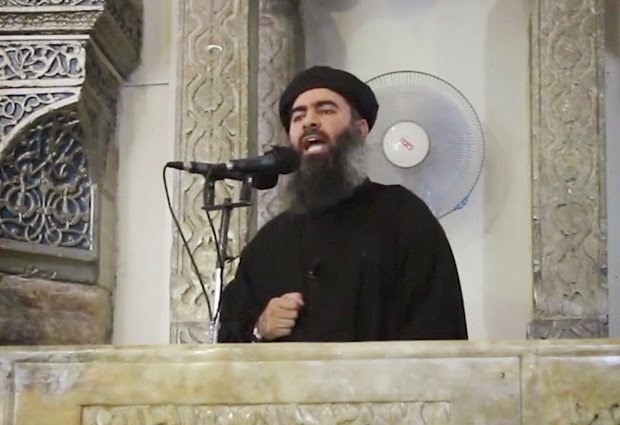 The reclusive al-Baghdadi is known to have made only one public appearance, purportedly delivering a sermon at a mosque in Mosul, as seen in a video posted online in June. That came five days after his group declared the establishment of an Islamic state, or caliphate, in the territories it holds in Iraq and Syria. The group proclaimed al-Baghdadi its leader and demanded that all Muslims pledge allegiance to him. Since then, part of the Islamic State group's core strategy has been to establish administration over lands that it controls to project an image of itself as more than just a fighting force. In parts of Syria under its control, the group administers courts, repairs roads and even polices traffic. It recently imposed a curriculum in schools in Mosul and in its Syrian stronghold, Raqqa, scrapping subjects such as philosophy and chemistry, and fine-tuning the sciences to fit with its ideology. As his forces swept across northern and western Iraq in June and July, they seized towns, causing several of Iraq's army and police divisions to fall into disarray in the worst crisis in the country since U.S. troops withdrew in 2011. On Friday, Obama authorized the deployment of up to 1,500 more American troops to bolster Iraqi forces, which could boost the total number of U.S. forces to 3,100 and spread advisory teams and trainers across the country, including into Anbar province where the fighting has been fierce. The militant Islamist group has overrun a large part of the province in its push to expand its territory, which stands at about a third of both Iraq and Syria. Last week, hundreds of men, women and children with the Sunni Al Bu Nimr tribe were killed by the militant group, which apparently feared the tribe would challenge its authority in the province. Officials with the Iraqi government, as well as officials with the coalition targeting the extremists, repeatedly have said that Iraqi tribes are key elements in the fight against the Islamic State group since they are able to penetrate areas inaccessible to airstrikes and ground forces. In an interview with CBS' "Face the Nation" that took place Friday and was broadcast Sunday, Obama said its airstrikes, which the U.S. first launched on Aug. 8, have been effective in scaling back the Islamic State group's advance. "Rather than just try to halt ISIL's momentum, we're now in a position to start going on some offense," Obama said. "The airstrikes have been very effective in degrading ISIL's capabilities and slowing the advance that they were making," he added. Abdul-Zahra reported from Boston. Associated Press writers Robert Burns in Washington and Ryan Lucas in Beirut contributed to this report.